Dungeons and Dragons is confusing territory these days. You have your official product with its own reactionary and progressive factions (3.5e / 4e / NEXT), 3e OGL forks (Pathfinder) the Old School Renaissance with its retroclones (LotFP) and neoclones (Dungeon Crawl Classics), nu-school emulators (Dungeon World, Torchbearer), and of course the folks who invested in OD&D or 1e AD&D back in the day and their copies are doing just fine with the duck tape along the spine, thanks. For the purposes of this overview, it’s possibly best to forget all of that. Because while Beyond the Wall technically uses “the world’s most popular RPG” as a foundation, all of the activity that is considered old school (romping around dungeons, rolling up disposable characters and killing stuff for treasure) is secondary. This is a game about emulating YA fantasy (principle inspiration is Lloyd Alexander’s Prydain and Ursula LeGuin’s Earthsea). At the same time it’s intended to be pick-up-and-play; you may be forgiven for thinking that it’s aimed at teen players, but in the How To Play booklet it acknowledges that “as we [get] older… it’s hard to schedule [a regular game]”. So this is a nostalgia trip for aging gamers with busy schedules. Well, perhaps it is. But all the things that make YA accessible to readers (such as youthful protagonists) are present in this game too, so it would probably make a fine introductory game anyway. Still, if the “for kids” pigeonholing bothers you, you could call it “timeless” instead. A lot of fiction follows the Hero’s Journey, although YA tends to do be very efficient in transitions through the cycle. 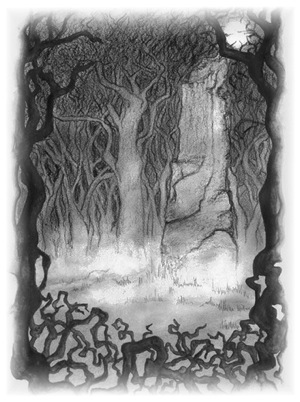 Calls to Adventure and Crossing the First Threshold are staples of not only YA but any kind of fantasy/fairytale game. But also the cycle will include those stages in the Ordinary World and Returning with the Elixir, where the heroes’ domestic lives and relationships are established. Here is where Beyond the Wall excels: through use of playbooks (actually these are more like lifepaths) the character’s back story is established, as well as inter-party links. Each playbook is a series of tables that cover childhood and then development into the functional PC (with an established class). Beyond that, there’s a collaborative element in creating the village. Crucially the village is populated by homes, friends and families and must be worth saving so the PCs return time and again to the village as a safe space where they want to be. OK, what do you get? The electronic version separates these books into individual booklets of between 4 and 30 pages. It certainly goes down easily. Note that there are no fewer than four free extras for this game — three additional set of PC playbooks (Nobles, Demi-Humans, and Villagers) and an adventure with goblins. I assume the word “playbook” has been deliberately appropriated from Apocalypse World terminology. It’s a good move; it capitalises on one of AW’s greatest strengths, which is to provide the new player with a complete package for starting their character off. Working through the playbook not only develops back story (childhood events) but also incorporates other player characters; at one point in the lifepath the player to your right will have been present during an event and will gain a stat bonus for having been there. Each playbook is a character class married with a character concept; for example the Reformed Bully is a Warrior, the Untested Thief is a Rogue, and so on. If you want an example of character generation a group of bloggers created their own virtual play circle and worked through some of the books. At the end of all this, you’ll have a bunch of ready-made D&D-style adventurers, ready to go Beyond the Wall and into dangerous territory. Before you do this there’s a neat little collaborative section on creating your village. Once that’s done, scenarios (of which there are two) follow a similar random generation as the characters, so again it’s good for picking up and playing. Magic is redesigned with Cantrips, Spells and Rituals; spells are all at the same “level” and the number of daily castings is equal to the Mages’ level. There are skills, but these are free form (as opposed to a defined list). Everyone gets at least one skill. Skill checks are always done by rolling under one’s attribute. Combat is the usual D&D stuff: roll to hit the opponent’s AC and then roll damage. There are only three classes (Warrior, Mage, Rogue) but a lot of variation with the playbooks, and some examples of dual-classing. BECMI-style saving throws, though these can optionally be changed to the Fortitude/Reflex/Will saves structure. No 3e-style feats. No attacks of opportunity. No encumbrance rules. This is not a crunchy game, nor is it a high-powered, high fantasy game. It is also not a lethal game in the way that most D&D is — PCs begin better equipped than 1st level characters in other games. Dungeon World brings the whole Apocalypse World experience to D&D, allegedly. Playbooks are one aspect, and moves are another. But this is where it gets a bit tricky. I’m told by those with more experience than me that the moves in DW tend towards task resolution. Now, the way moves are supposed to work is to have players make conscious, affirmative decisions regarding character actions; make the moves suddenly about task resolution and it becomes not only more reactive than proactive, you risk getting bogged down in the minutae of task resolution, which is precisely what moves and “let it ride” are supposed to avoid. And this is why I can’t really see the point of Dungeon World. You need to impose a new terminology and process on your players when D&D as a framework is perfectly functional. Naturally there will be people who feel at home with *World games and will hate D&D, in which case DW may be for them. For everyone else, Basic D&D and the various free OSR clones are perfectly functional. And this is why I conclude that Beyond the Wall has the potential to be a better Dungeon World than Dungeon World. Writing your own playbooks is simpler for BtW and is mostly about balancing the final character power level with the other books — something that’s a lot more transparent with an OSR game than a move-based game where it may be hard to predict how disruptive moves are. There’s no relearning of either terminology or procedure required, either. Right now I’m thinking about how to make use of this system to run Garth Nix’s Old Kingdom.